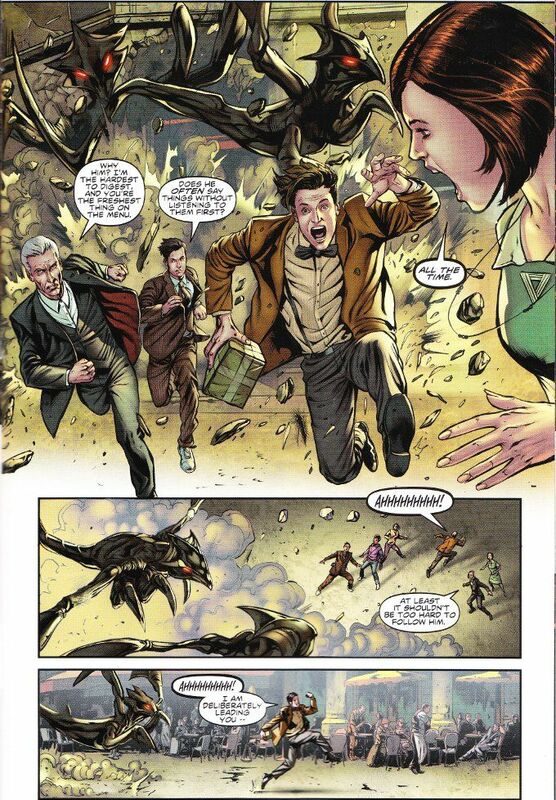 It's no surprise that Paul Cornell's script for this issue draws deeply from the well of Doctor Who's rich mythology. After all, Cornell co-authored The Doctor Who Discontinuity Guide back in the BI (Before Internet) days and has a knowledge of the show's history that is second to none. Yet Cornell also sprinkles the book with the goodly helping of humor common to his stories, finding unexpected angles such as the playfully loony Eleventh Doctor being forced to be the responsible one as Ten and Twelve start arguing and Twelve lamenting that he's now "Scary Doctor" to Ten and Eleven's Posh and Baby. Neil Edwards proves a perfect playmate for Cornell. This is a manic energy to Edwards' action sequences and he perfectly captures the likenesses of the characters from the show. All in all this comic is a must-read for all Whovians.